Finding work like this that someone actually paid for leaving their loft in a dangerous way really annoys me. It only take a little more effort to make it safe. Cowboys at it again, and people still falling for it. When you get a job done before you pay for it inspect the work fully until you are happy, then pay. Never give any money upfront and a deposit. Want loft storage but your builder / developer recommend you don't? 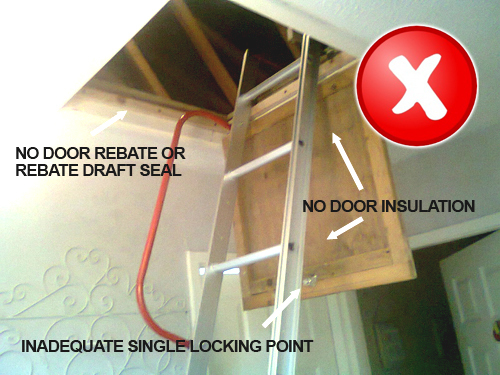 Want to know why they recommend you don't get your loft boarded? This is very common these day's that pretty much all developers / builders of new homes do not recommend you board your loft. So why won't they recommend boarding out your loft? The answer to this is twofold. Firstly they do not like to recommend any products, tradesmen or service providers for the simple reason if things go wrong they don't want the comeback. This I can understand as they cannot guarantee these tradesmen will be reputable even if they have been used by others in the past, so they leave it to you to find your own tradesmen / services. The second reason they don't want you to board your loft is the fact that there is a lot of insulation in new builds and its very high, so they presume to board a loft they insulation would have to be removed or worse still squashed. Not too many years ago there was an influx of these "so called joiners" knocking on the doors of new build housing estates and selling cheap loft boarding from as little as £200. What these guys didn't know is how to install a safe strong supporting sub-frame to hold the boarding and storage weight. But... There is now a way to safety board your loft for storage even if you have high insulation levels without having to remove it or squash it down. There is a system called LoftZone raised loft floor, and this allows a simple but very unique raised platform to be built above the insulation levels of up to 300mm, without any compromise to the existing insulation. This system is supported by the carbon trust, its energy efficient and is made in the UK. It's won many awards including invention of the year at the Ideal Home Exhibition. So now you know there is a product to board a loft in a new build house why won't the developers use it? Now the problem is that the builders / developers still have their blinkers on and even though some are starting to see the light, they still won't recommend boarding your loft for storage for no other reason than because of bad boarding in the past. Now this new system has been introduced on to the market and is professionally installed by factory approved and certified installers. Things are about to change. Oh yes, although the builders / developers will never recommend a trade but having your loft boarded professionally they cannot disagree with as it is all done to a code of practice, is safe and does not affect the loft insulation, cause condensation or weaken your ceiling or roof. FREE surveys and written detailed quotes should always provided for this type of work, (as simple as it may seem) it cannot be guessed at. Never do the deal over the phone or by email. Topped up your loft insulation? What about the old inefficient loft hatch ? The revolutionary design of the multi-point catch mechanism means that the GL250 door can maintain a more effective air tight seal around the entire accessible opening, helping to meet the air leakage requirements of Part L of the Building Regulations and preventing the problem of moist warm air entering. Many drop down hatches suffer from ‘sagging’ over time, a problem that can cause the middle of the door to bow away from the door seal, creating an air leakage path. To prevent this issue, the GL250 door has 12 independent catch points located around the perimeter of the frame, operated from a single position with a unique sliding mechanism. With the sliding cover replacing a conventional twist action locking mechanisms on the door, all of the hinge, catch and fixing geometry has been carefully located outside of the door seal, meaning that there are no holes through the door that could pose an air leakage risk. A ceiling is a ceiling that is all it is meant to be, they were built to hold up the plaster board or lathe plastered ceiling and for the occasionally walking on the joists for services reasons. Some older properties because of the type of roof timbers such as a purling support system or a trussed roof will make a difference to the overall strength. Older ceilings like a Victorian terraced tend to have a purling supported roof which is a big beam from supporting wall right through the support wall opposite. Some have extra support in the centre which rests on the internal supporting brick walls so the purling’s do not sag over the years. If you have ever had a look inside an older terraced house style loft you may have seen strips of wood hanging around attached from ceiling to roof? These are known as hangers, and they are there to give extra support (especially in the center of a bedroom) to prevent the ceiling joists from sagging over the years. Usually 3x2 timber joists runs from the back wall under the eaves of the roof to a central wall for support then from the central wall another set of joists run to the front of the house under the eaves. A lot of older properties suffer from ceiling sag which is normal because the roof may have also sagged but the hangers come loose where the nails have rusted away so they stop bearing weight. These all need to be checked and broken or loose ones need to be replaced with modern timber versions anyway before considering boarding. Answer is, yes if done correctly. Adding a batten (2x1 or 2x2) strip of wood is nowhere near any use or support and hardly adds any strength to the existing ceiling, new supporting timbers must be much more substantial than this. Also you cannot get hardly any insulation underneath to insulate your home. It’s not rocket science but some “cowboy builders & joiners” really have no clue. But a specialist will know all there is to know about doing this job correctly. · Check all ceiling hangers are fixed and not rotten or broken, replace if they are. · Lay the frame in the centre of your loft with the supporting wall in the middle of you frame and the outer edges underneath a purling’s. · Hanging the frame on the purling’s will take off any pressure to the ceiling joists below and will raise it enough to get insulation underneath as well as allowing important air flow ventilation through the insulation. · Once the sub-frame has been leveled and adequate supporting hangers have been fitted the new sub-frame will be very strong and allow at least a couple of people and lots of storage to be supported without any worries of it damaging your ceiling. · Once the sub-frame has been levelled set in place and fixed down then you can lay down the boards, ideally in staggered formation if possible without creating waste. · Never nail down only screw down you may need to remove the board at some point and nailing can crack ceiling plaster work with the impact. So if you didn’t do all this preparation work before hand and you simply laid boards on to the existing ceiling without the extra support and strengthening you will be asking for trouble? It will put pressure on the ceiling causing increased sag and the more weight the more it will become worse and eventually it will crack or damage the ceiling beyond a simple repair and replacing a ceiling timbers and plasterboard is very messy and very expensive to do. Loft boarding is part of general building, as simple as it may sound as a professional company we have to work to building rules and regulations. Building in general is all about making it safe to use and sticking to rules to prevent any weakening of the existing structure. Anyone choosing to ignore these rules should not be in the building profession. Usually the ceiling joists are part of the actually trussed roof frame so they are already very strong and never really require any added support if the new storage floor system being added is designed to distribute the weight evenly. We use LoftZone StoreFloor which is a unique stilt and beam system designed to be installed directly to the existing ceiling joists to raise the ceiling floor above the insulation so as not to squash or remove any existing insulation which is normally up to 270mm high. Most new loft joist are around 4” to 5” tall allowing room for the first 100mm of insulation to go perfectly in between the joists then a second 200mm layer laid opposite the first. Being on average 2” thicker and slightly wider than is predecessor in the Victoria era this instantly give the ceiling joist more support to handle modern style loft boarding solutions like the LoftZone StoreFloor system. Normally as we did with the Victorian house we only use the central area in this case this would be the highest parts down the centre of the loft known as the apex of the roof. Using the eaves can be done but this restricts access and the pitch of the roof is lower which also cuts down on the storage height, so you must consider if it is worth using these area. It can handle a fair bit of weight as a rule if you cannot lift it to the loft then that one item is too heavy so you need to split it up in to different boxes. Total weight is really determined by the strength of the ceiling timbers, extra reinforcement and how well the storage floor is built. Most strengthened ceilings can manage at least two or three people and many storage boxes containing general items so long as you distribute things evenly throughout the loft then you would be surprised at how much weight can be stored in your loft. For advice on this please ask the surveyor when they do a site survey they will give you their professional opinion on your type of loft as to how much storage weight is possible.